Experiment I: Addressing the impacts of a low-dose addition of silver nanoparticles vs. silver ions in a coastal marine ecosystem. Timing of the experiment: The large-scale mesocosm experiment will take place between middle May and middle June (approx. 4 weeks). This period includes preparation, setting up of the experiment, conduction and after-work, when all participants are expected to participate as an integral part of the application period. In total, approximately 250 person days will be available for TA users under the AQUACOSM project. The project will support the travel expenses (travel, accommodation etc) of approx. 10 persons for approx. 30 days (or other combinations). Interested TA users are welcome to contact Dr. Paraskevi (Vivi) Pitta <vpitta@hcmr.gr> and Dr. Anastasia Tsiola <atsiola@hcmr.gr> well before the application deadline. Nowadays, silver nanoparticles (AgNPs) are increasingly used in consumer products due to their unique physico-chemical features and antibacterial properties. There is evidence that AgNPs are toxic to several planktonic taxa and their indiscriminate use may lead to the development of microbial resistance. However, the fate of AgNPs into the marine environment is currently not well studied, despite the fact that AgNPs may influence specifically the coastal marine ecosystem in the near future. Based on the recently developed flow injection on-line dilution single particle inductively coupled plasma mass spectrometry (spICP-MS) method, it became feasible to detect and characterize AgNPs directly in natural seawater at low ng Ag L-1 concentrations (Toncelliet al., 2016).The mesocosm experiment that followed the method development revealed that ng AgNPs L-1 were toxic to several bacterial phyla, diatom and dinoflagellate genera and viruses in terms of taxonomy, lysogeny potential and auxiliary metabolic gene content (Tsiolaet al., 2018). Nevertheless, it remained uncertain whether a) the ionic (Ag+) or nanoparticulate silver caused the toxicity, b) natural ligands and organic matter in the seawater reduced the final toxicity to other plankton and c) the toxicity was seen further up the food web (i.e. at the copepod level). In addition, it was not clear which was the intracellular silver concentration in the different microorganism size spectra and which were the toxicity mechanisms (e.g. direct uptake) of AgNPs and Ag+for the cells. The aim of this experiment is to compare the impacts of a stepwise addition of ng L-1AgNPs versus Ag+ to a natural coastal planktonic community targeting viruses, bacteria, phyto- and zoo- plankton (including copepods). We will set up 9 mesocosms of 3-m3 each at the HCMR Cretacosmos facilities (triplicate control mesocosms, triplicate mesocosms that will receive AgNPs and triplicate mesocosms that will receive Ag+). TA users interested in plankton community structure and function, ecotoxicology and marine ecology are encouraged to apply for participation and funding. Experiment II: Deepening the knowledge on the dissolved phosphorus uptake in the P-limited Eastern Mediterranean. 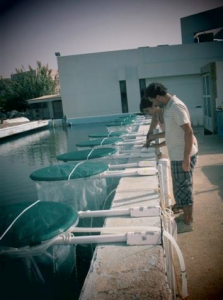 This experiment will be part of the research activities of the “Centre for the study and sustainable exploitation of Marine Biological Resources (CMBR)” which is an integrative large-scale Greek Research Infrastructure (RI) of the National Roadmap for RI’s. Timing of the experiment: The mesocosm experiment will take place from middle of September until middle of October, 2019. The total duration will be approximately 4 weeks, including preparation and experimental set up, experiment and after-work. Participants are expected to participate through the whole procedure from preparation to after-work. Transnational Access (TA) users are welcome to apply for a range of activities: see below for details. In total, approximately 100 person-days will be available for TA users under the AQUACOSM project. The project will support the travel expenses (travel, accommodation etc.) of approx. 3 persons for approx. 30 days (or other combinations). Interested TA users are welcome to contact Dr. Paraskevi (Vivi) Pitta <vpitta@hcmr.gr> and Ms. Ioulia Santi<isanti@hcmr.gr> well before the application deadline. During the past 20 years, a lot of attention has been given to oligotrophic habitats and their response to trophic status alterations. The Mediterranean basin is an ideal system for studying such responses since its unique P-limited seawater has led to the identification of different nutrient uptake scenaria that provoked a lot of discussion.With climate change phenomena introducing nutrients more often and less predictably into the sea, basic research that leads to a better understanding of plankton responses to nutrient additions is necessary. With this experiment we will revisit the topic of P-uptake by plankton in the oligotrophic, P-limited Eastern Mediterranean and will further focus on higher resolution approaches to study plankton communities.We will focus on the immediate response to P addition of bacterial and eukaryotic communities in terms of diversity and function. Moreover, extra attention will be given to the meso-zooplankton community by focusing on their egg production activity, on their offspring’s diversity (eggs and nauplii), and also on their feeding behavior. Having understood the overall response of the system, this experiment will take previous knowledge to the next level by studying changes also at the molecular level. TA users interested in plankton community structure and function, ecotoxicology and marine ecology are encouraged to apply for participation and funding. Trainees are warmly invited to apply and participate to this experiment. Investigate the biological N2 fixation. Are there changes in the N2 fixation rate due to phosphorus adequacy? Work as trainees and therefore gain experience on mesocosm experiments set-up and on laboratory analyses. Fodelianakis S, et al. (2014). Phosphate addition has minimal short-term effects on bacterioplankton community structure of the P-starved Eastern Mediterranean. Aquat. Microb. Ecol., 72: 98-104. Pitta P, et al. (2016). Confirming the “Rapid phosphorus transfer from microorganisms to mesozooplankton in the Eastern Mediterranean Sea” scenario through a mesocosm experiment. J. Plankton Res., 38(3): 502-521. Sebastián M, et al. (2012). Bacterioplankton groups involved in the uptake of phosphate and dissolved organic phosphorus in a mesocosm experiment with P-starved Mediterranean waters. Environ. Microbiol., 14: 2334–2347. Thingstad TF, et al. (2005). Nature of phosphorus limitation in the ultraoligotrophic eastern Mediterranean. Science, 309: 1068-1071. We plan to open our facility for AQUACOSM TA either in May/June or in September/October 2018. We have already contacted some colleagues and have preliminary plans about a couple of experiments. We intend to set up a group of people to come to our facility and according to the interest that will be expressed for our facility. At least 300 person-days will be offered to external users supported through the AQUACOSM Transnational Access provision in years 2018, that is 6-8 persons for 25-30 days. Projects of external users will be integrated in the general schedule of the facility. CRETACOSMOS is part of the Hellenic Centre for Marine Research (HCMR) in Crete. 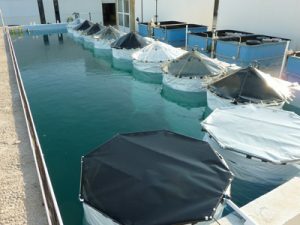 It is the only place in Europe where truly oligotrophic conditions can be studied in a well- controlled mesocosm facility. 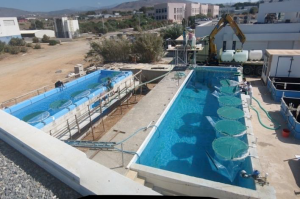 The CRETACOSMOS facility includes 12 pelagic mesocosms (3 m ) and 9 benthocosms, which are incubated in two large temperature-controlled concrete tanks (150 m volume and 3 m depth, and 350 m volume and 5 m depth, respectively; Fig. 6.4.1). The pelagic mesocosms are low- density polyethylene bags of 1.32 m diameter, enclosing 3 m3 of water. The benthocosms are low-density polyethylene bags 0.64 m in diameter and 4.5 m high. They hold 1.5 m3 of water and a container with 85 L of sediment at the bottom. The smaller (150 m ) tank is equipped with a fully automated heating/cooling system that allows temperature manipulation and control within ±0.5 oC of the target temperature. Water of the Eastern Mediterranean is collected off Heraklion aboard the R/V Philia, a 26 m long research vessel, and transported to the facility by lorry to fill the mesocosms. Given the oligotrophic nature of the water, special care is taken to avoid contamination. A lid protects the mesocosms from aerosol deposition. Water mixing is achieved by gentle bubbling into a vertical PVC tube, creating an airlift from just above the mesocosm bottom to just under the surface. The possibility to heat water and control its temperature allows running climate-change experiments since 2013. Similarly, the benthocosms, built in 2014 and containing a relatively large sediment volume, open the possibility to run experiments on benthic-pelagic coupling. In addition, the concrete tanks can be used to test large instruments. The mesocosm facility is complemented by modern laboratories: a chemical lab to analyse dissolved and particulate nutrients; a radio-isotope lab (14C, 3H, 33P) to measure primary and bacterial production and phosphorus uptake; a culture lab equipped with an autoclave, laminar-flow cabinet, incubator, etc. ; an automotive lab obtained in 2015; several general-purpose labs and a constant-temperature room. Other equipment includes a -80°C freezer and a flow cytometer (FACSCalibur) to count viruses, bacteria and cyanobacteria as well as pico- and nanoflagellates. Inverted and epifluorescence microscopes with automated image analysis systems are available to identify and count nano- and micro-plankton. The facility is also supported by a zodiac. Fig. 6.4.1. Panoramic view of the CRETACOSMOS facility (left), sampling of the mesocosms (middle), view of the benthocosms (right). Photos: P. Pitta. Seven large-scale experiments have used the CRETACOSMOS facility since 2009: Nutritunnel (2009: Norwegian Research Council), MESOAQUA (2010 and 2012: EU-FP7), MedSeA (2013: EU-FP7), ADAMANT (2014: EU Social Fund plus national funding); HYPOXIA and AQUANANO (2014 and 2015, respectively: both EU and national funding). Additionally, an enclosure facility moored offshore; the Lagrangian Mesocosm Platform (LAMP) operated by Partner 10 (CNRS-MARBEC), was successfully tested in 2011. Over 90 scientists from 22 countries in Europe, the Americas and Asia participated in these experiments, addressing various aspects of global environmental change. 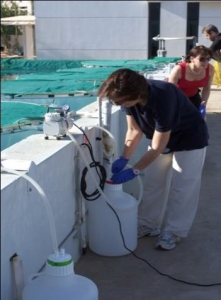 For example, the experiment in 2013 was the first to assess the combined effects of seawater warming and acidification on the pelagic food web of the oligotrophic Eastern Mediterranean, and the benthocosms were first used during a two-month experiment addressing the effect of eutrophication on benthic-pelagic coupling. A total of 688 person-days will be offered to external users supported through the AQUACOSM Transnational Access provision in years 2-4, a minimum of 6 persons for 30 days each year. Projects of external users will be integrated in the general schedule of the facility. Services currently offered by the infrastructure: Users of CRETACOSMOS have access to the full range of mesocosms, laboratories and instrumentation described above. Visiting scientists supported by AQUACOSM are encouraged to cooperate with local scientists to benefit from specific expertise on the local environmental conditions. Support offered under AQUACOSM: The laboratories, research vessels and equipment described above will be at the disposal of the users of CRETACOSMOS under AQUACOSM. To maximize scientific advancements and output of the TA activity, users will receive support in terms of planning of activities both before and after arrival. Hands-on training by the local team of academic and technical staff. IT support, a library with on-line access to all major marine science journals will also be provided. Building on dedicated administrative staff and ample experience gained since 2009, an efficient administration mechanism is in place. The HCMR research park in Heraklion (Thalassocosmos) where 31 scientists of 3 institutes work on oceanography, aquaculture, fisheries, marine biology and genetics offers a stimulating broader scientific environment. Visitors under AQUACOSM are encouraged to get involved in the academic discourse in both formal and informal ways.